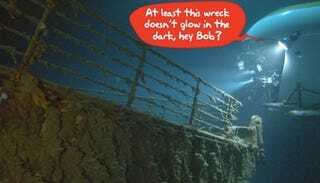 According to newly declassified info and the lead scientist himself, Dr. Bob Ballard, the successful search for the Titanic wreck was actually part of a secret hunt for two sunken cold war American nuclear submarines. The USS Thresher and USS Scorpion had both foundered in the 1960s, and the Navy needed to know what had happened to their reactors over the years. When Dr. Ballard approached them in 1982 for funding to find the Titanic with his new deep-diving robot submersible, the Navy saw the opportunity and granted him the money on the condition he first inspect the two wrecks. Ballard agreed, and in 1984 set off to investigate. Thresher had been the most advanced attack sub of its time, but in 1963 had an accident during testing that left it without power. Ballard's robotic survey discovered that it had sunk so deep it imploded, turning into thousands of pieces. His 1985 search for the Scorpion—which had disappeared in 1968 with 99 crew, and was thought to be a victim of a Soviet attack—revealed such a large debris field that it looked "as though it had been put through a shredding machine." The survey data revealed the most likely cause of the loss of the sub was one of its own torpedoes going rogue and hitting the sub after firing.